THROWBACK: Can You Name America’s Longest-Running Cooking Show? The answer is PBS series Ciao Italia with Mary Ann Esposito, a program famous for fresh, seasonal Italian dishes and Esposito’s grade school teacher authority. The show debuted in 1989 and celebrated its 25th season this year, because 1989 is longer ago than we all think. 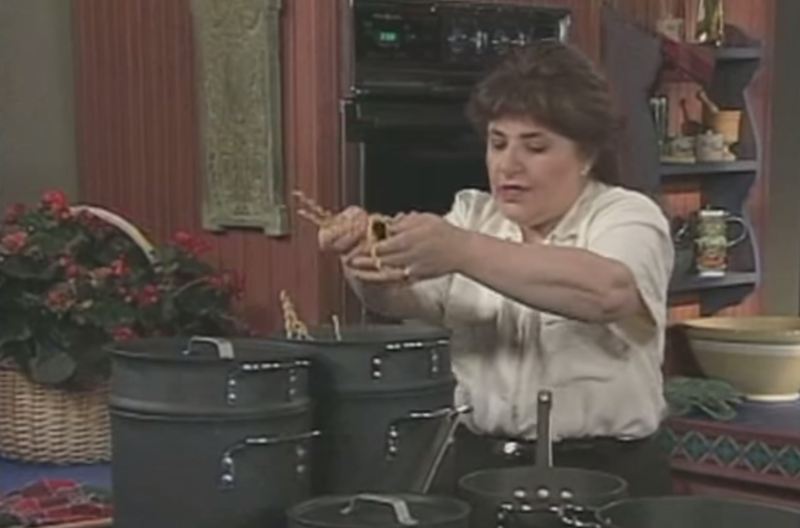 For this week’s Throwback Unpack, I’ve selected an old clip of Esposito making Chicken Cacciatore with her mother. Is it the pinnacle of the series? Probably not. But, much like the Cacciatore itself, it is quite a special treat. While the garlic and onion provide a flavor base, and the tomatoes bring sweetness and acidity, it is the Robert Altmanesque layered dialogue between the two women that gives the dish its real “zip.” If you transcribed the clip, itwouldlooklikethisyesitwouldlooklikethismushroomschicken. It’s a great reminder that one of the perks of a strong mother-daughter bond is the ability to have an entire conversation with each other without once listening. It’s also hilarious and sweet.